"Can you do something about my constipation?" 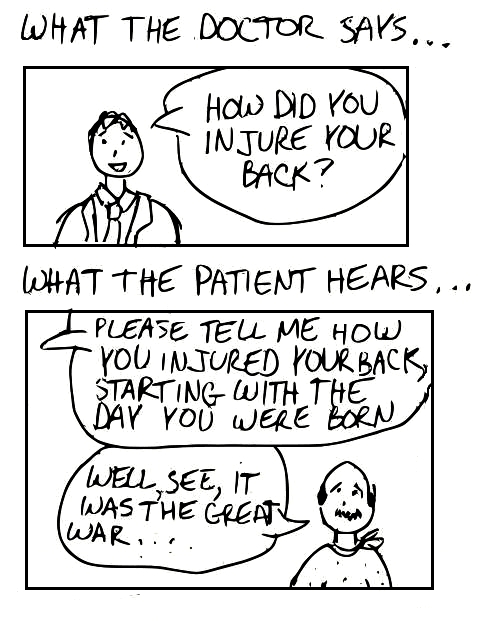 Had four sciatica/miagrane patients today....so dead on, it's not funny. My attending would get so frustrated, he'd say, "Point with one finger... and you can't move that finger!" I like the patients whose numeric scale of 1 to 10 includes "kind of ouch, you know, but sometimes not like when it's the other way." Or "a million." I think I'm having a PTSD flashback in response to your post. Nurse: "How would you rate your pain right now?" Nurse: "OK I can't write 10 because you're not crying." That seems to elicit shock, awe and confusion. Or, patient: "Well no I don't know my meds because my wife has the list. No, she doesn't know I'm here and she's probably not coming. You ought to call her." 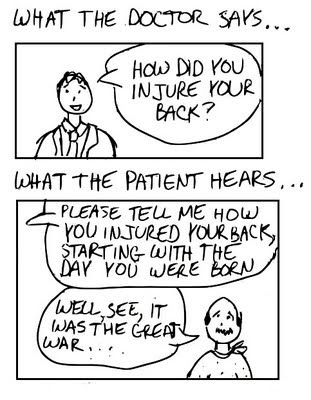 My triage days I learned really quick to ask the right quest. Instead of "why are you here tonight?" it was "what one event made you leave the comfort of home from your lay z boy to come here?"